Dark-skinned people in Finland struggle with discrimination on a daily basis. On week days many struggle in vain to find work related to their studies -- or even unpaid internships. Some of those who have given up seeking skilled jobs are sometimes mistreated, disrespected and exploited in odd jobs for which they are overqualified. On weekends many who go out to nightclubs and bars suffer indignities and rejection in the hands of doormen and security guards. A Yle TV programme scheduled to air on 17 October 2013 at 8 PM (GMT+2) on Yle TV2 uncovers discrimination in everyday life in Finland. According to the programme, skin color makes a difference in Finland when looking for accommodation, in the job market and in nightclub queues. Yle sent out three men - a native-born Finn, an immigrant from Russia and one Somali - to find out how discrimination targets immigrants in everyday life in Finland. 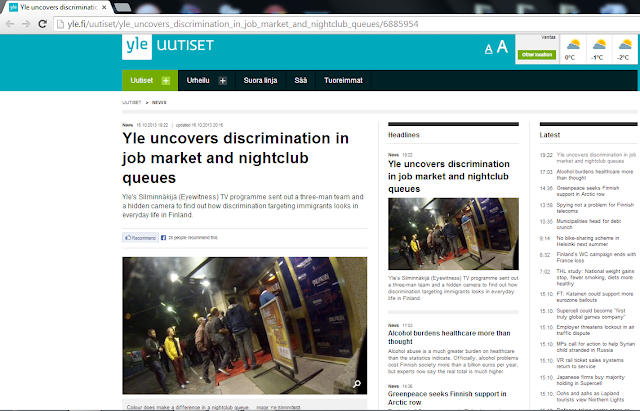 According to Yle, all three young men have lived in the country for a long time and speak the local language well, all three had the same cover story related to work experience, income and education. All three applied for a job, applied for accommodation and tried to get into a nightclub under the same conditions. The programme reveals that at a nightclub, the Somali was denied access by the doorman, while one of the white test team members was let in. At another nightclub the Somali and the Russian immigrant were denied access on grounds that their Finnish driving licences presented as identification were insufficient. The Finnish team member was let in with only a driving licence. The three young men sought the same ten jobs. The native-born Finn was invited to two interviews, the Russian was invited to two and the Somalian was invited to none. A search for rental accommodation also left the Somalian discriminated. According to the journalist behind the programme, the experiment recorded "clear evidence of discrimination". The journalist - described by Yle as a "white-skinned Englishman" - was shocked by the results of the experiment. Personally, I am not shocked by the findings. As a person of African descent who has lived in Finland for over four years, I have faced my share of discrimination. For instance, a couple of years ago, a group of friends and I were denied entry into a nightclub in Helsinki. Of course we thought it was discriminatory and refused to leave the queue. The doorman said he would call the police if don't leave. Believing that the police won't allow discrimination, we implored the doorman to call. The police came and told us - to our surprise and disappointment - that doormen have the right to deny us entry. They suggested that we should find another club. I've also been denied access to a nightclub on grounds that I didn't have a [winter] jacket. In another shocking incident which I experienced first-hand, a young man of Somali origin came out of a nightclub for a smoke. The doormen denied him access when he tried to return. When he insisted they restrained him on the ground and called the police. One of the guards had a knee on the Somali's head against concrete. When the police came, the Somali was handcuffed and taken into the police van. In my view, the TV programme by Yle uncovers the plight of the average dark-skinned person in Finland. While it may shock some viewers, I am convinced that dark-skinned people who have lived in the country long enough will relate to the experience of the Somali in the programme and will not be surprised by the abysmal discrimination.